In geometry, angles can be classified according to the size of the angle. right angles, acute angles, obtuse angles, straight angles, reflex angles and full angles. 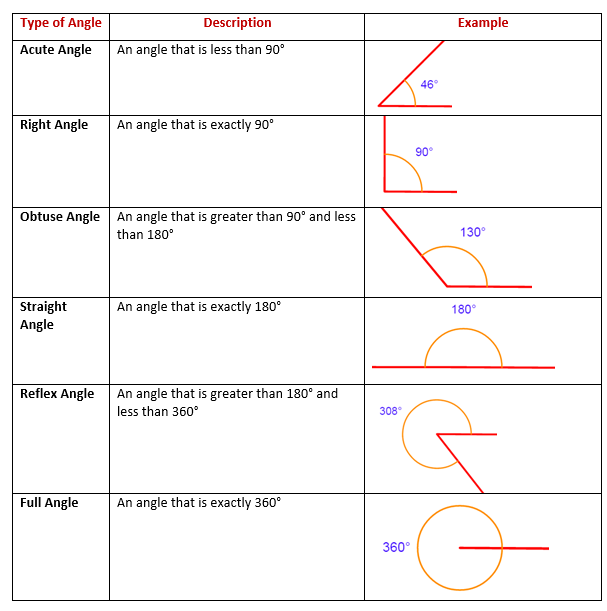 The following table shows the different types of angles: right angles, acute angles, obtuse angles, straight angles, reflex angles and full angles. Scroll down the page if you need more explanations about each type of angles, videos and worksheets. What are the types of angles? The following video will demonstrate and distinguish between the different types of angles: right, acute, obtuse, straight, reflex and full angles. A right angle is an angle measuring 90 degrees. Two lines or line segments that meet at a right angle are said to be perpendicular. The following video explains more about right angles. A straight angle is a straight line and it measures 180 degrees. What are the differences between a right, acute, obtuse and straight angle? A reflex angle is an angle measuring between 180 and 360 degrees. A full angle is an angle of one complete turn which is 360 degrees. An angle of one whole turn is 360˚. How to draw reflex angles?